Sanders, Trump lead New Hampshire polling averages. 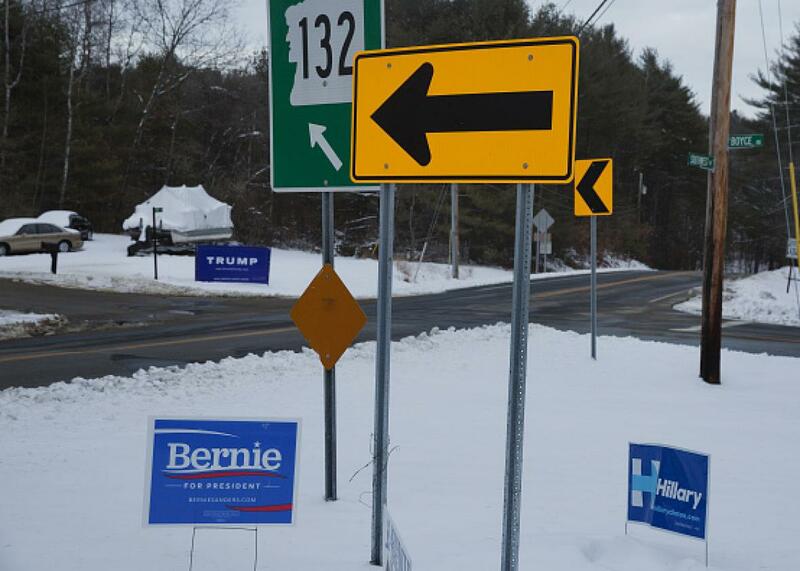 Campaign signs in Canterbury, New Hampshire, on Feb. 6, 2016. RealClearPolitics’ averages have Sanders leading Hillary Clinton 53.3 percent to 40.5 percent and Trump 17 points ahead of the Republican pack. The “CNN Poll of Polls” has Sanders leading 54 percent to 40 percent and Trump 16 points ahead. And FiveThirtyEight’s comprehensive projections (which factor in state and national polls and endorsements) give Trump a 71 percent chance of winning and Sanders a higher than 99 percent chance. The real action is in the competition for second place in the Republican field, where CNN and RCP both have Rubio’s support at 15 percent; all of the CNN polling and most of the RCP polling, though, was conducted before Rubio’s already-infamous performance in Saturday night’s debate. John Kasich, who seemed to do well in the debate and has picked up a number of New Hampshire endorsements, is in third in the FiveThirtyEight projections and in fourth, narrowly behind Ted Cruz’s 13 percent, in both the CNN and RCP numbers. Read more Slate coverage of the 2016 presidential election.